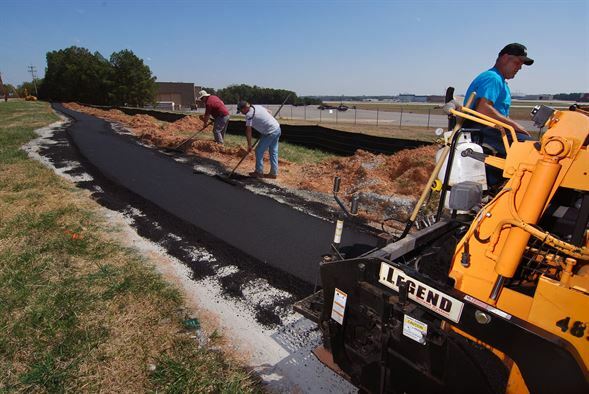 Charlotte NC Paving is well-staffed and armed with the latest technically advanced paving equipment. Our employees are full time professional asphalt pavers with excellent skills gained the hard way- many years of working on similar road development projects. These exceptional workers will complete within budget and on schedule any new asphalt roads, requested by our clients, that will function well for decades. Much of our infrastructure, in the USA, has aged to the point that many roads need extensive repairs and some have to be replaced. This is an expense some cash strapped municipalities are unable or reluctant to take on. However, municipalities can still increase property tax revenue without being burdened with road and utility maintenance by allowing developers of new subdivisions to build with HOA (Home Owners Associations). HOA's provide maintenance for the communities’ roads with paid monthly dues required of the homeowners. We can provide valuable assistance to the developer during the subdivision development. ​Charlotte NC Paving consultants goal is to help commercial clients save time and money yet still deliver optimal plan options to move forward with building a long lasting and robust road. ​Property owners, managers, developers, medical office maintenance, and any other commercial endeavor: Please contact Charlotte NC Paving at (704) 810-1305 to request a complimentary on-site consultation and estimate! If you’re not 100% satisfied with our assistance, be sure to let us know! We guarantee our services and will do our best to ensure that you are another satisfied customer! Work with a contractor you can trust not to change specifications to spare his expense at the expense of the quality of your road. Lower quality will translate into more than average road maintenance needed in the future. Material selection is important as the majority of asphalt is recycled constantly resulting in many grades of asphalt with different percentages of recycled material in them. Using a lower grade asphalt with a higher percentage of recycled material will affect the look and lifespan of your road. Request that your contractor use a higher grade of asphalt. Less than honest asphalt pavers will use a low grade of asphalt and hope you don’t notice or claim no difference in longevity or looks. All you need do is picture in your mind’s eye oil spills on parking lots to know recycled asphalt has contaminants in it that in sufficient quantities may cause issues. We preform maintenance at regular intervals on our extensive fleet of industrial specialized paving machines and trucks so no worries about equipment failings to push back your schedule. Our up-to-date paving machines, we have thousands invested, offer higher levels of installation speed, efficiency, quality and advance safety guards over some of our competitors' older machines. This allows us to meet or exceed our customers’ expectations for timely asphalt repair, resurfacing or build. A typical asphalt paving crew consist of 5 to 8 workers perhaps a few more for very large jobs. An understaffed asphalt paving crew will not only affect the timely outcome of the pavement project, but could affect the quality also. We are licensed, bonded and insured in the state of VA. Being licensed requires the passing of one or more tests, proof of formal training or so many years of on-the-job experience. The tests mostly cover safety requirements, and constructions laws. Being Bonded requires the Asphalt contractor to have secured funds, in case of a lawsuit, to pay for damages that have been ordered by a court of law. Being insured requires that a worker who is injured on the job, apply to the asphalt contracting company for compensation- not the commercial clients’ insurance- a very important protection for yourself that you should insist on and verify. 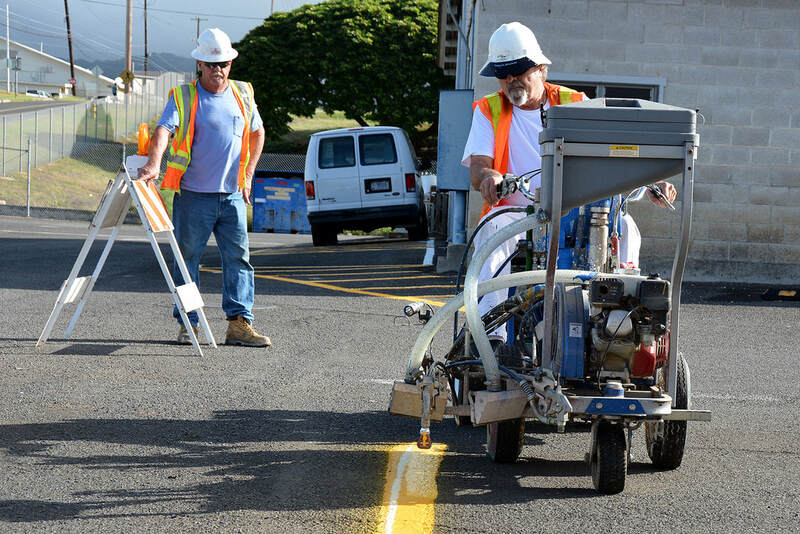 ​Survey crews will set reference points in the existing pavement or surrounding landscaped areas to guide the construction crews. All trees and vegetation within the roadway boundaries will be removed. If there are smaller plants you wish to preserve, they should be relocated to another site. Charlotte NC Paving can assist with removal of larger shrubs or small tress using on site equipment. These plants can be removed and placed away from the project site. However the client will be responsible for replanting them and their ultimate survival. If many large trees have to be removed, consider selling them to a Saw or Paper mill. When snow and ice on the roadbed might be of concern, it’s best to remove enough trees to allow maximum penetration of sunlight to the roadbed. This is called “daylighting the road”. ​Grading for water drainage is one of the most important processes to get right for a road to function at its designed bearing capacity for a full lifespan. Water will cause the road bed to move or shift- breaking up vast areas of pavement. Eventually, broken areas of pavement will become car damaging potholes on the road and perhaps even cause some accidents. Charlotte NC Paving has experienced graders that will make sure the water runs away from the road. ​Underground utilities, such as water, electricity distribution, natural gas, fiber optics, street lights, storm drains and sewer mains will be installed before any beginning any roadworks. Street light concrete bases will be installed before curb and gutters are placed, though the electrical conduits will follow later. Concrete curb, gutter and sidewalk will be placed. Electrical conduits will be placed behind new curb. A base layer of asphalt is laid once the concrete curb has cured sufficiently. Landscape retaining walls will be place as well as underground sprinkler systems. The final pavement layer will be installed. Line painting will be done. ​Need to know more about the services we provide? Please visit the home page- by clicking here.